... you knew you were getting close to Berry Lake when you smelled the mint fields along Blueberry Road (now Hwy R)??? Berrylakers said... and you had to roll up your car windows once you got onto Blueberry Road to keep the gravel dust from getting in the car (but it did anyway, and on those 90+ degree days, it stuck to your sweaty skin)...so you just HAD to jump into the lake as soon as you got here! August 24, 2009 2:20 PM Berrylakers said... Ed and Dot's (now Harley's Den) and Tom and Sophie @ the Berry Lake Club? August 24, 2009 2:21 PM Berrylakers said... when a 50 hp outboard was enough to pull up 4 slalom skiers, and the only inboard/outboard on the lake belonged to Micky Malcheski who parked his cabin cruiser here sometimes during the summer? August 24, 2009 2:22 PM Berrylakers said... the scent of this place when you first got out of the car after the long ride up here? It still smells wonderfully fresh and piney, but now that I live here full time I don't notice it as much anymore. Do any of you??? August 24, 2009 2:24 PM Berrylakers said... going to the Underhill dump and chatting with Pappy??? August 24, 2009 2:26 PM Berrylakers said... Reigert's and Klatt's taverns in downtown Underhill? August 24, 2009 2:27 PM Berrylakers said... going to the Hintz bar for fresh eggs (along with pickled ones...yuck!) and conversation with Louie and Joanne? August 24, 2009 2:32 PM Berrylakers said... when windsurfing, not wave-running, was popular here??? August 24, 2009 4:15 PM Berrylakers said... hydroplanes???!!! August 24, 2009 4:18 PM Berrylakers said... "da...da...dadadadadadadada...dadadadadadadadada...da da da da da da da da da da...da da da da da da da da da...HEY!" was heard across the lake on warm summer eves??? August 24, 2009 5:35 PM Berrylakers said... you heard whippoorwills every night before going to bed? August 24, 2009 6:12 PM Berrylakers said... the Krueger's barn that stood on their grounds on the east shore? I miss that landmark here on the lake! August 26, 2009 3:49 PM Berrylakers said... there was an alternate route through the Town of Underhill and you had to drive over that neat, old metal bridge to cross the Oconto River to get to Reigert's or Klatt's taverns? I've seen some of our best fall colors from that old bridge. August 26, 2009 3:51 PM ginny said... 1956 - my dirty fanny was washed under a pump on the back porch with ice cold artesian (?) water - I hate cold water to this day!!!! Then i graduated to an outhouse decorated with cartoons tacked to the walls, P.U.!!! Thank God for plumbing installed in 1965. August 27, 2009 10:32 AM Jennifer said... Sitting on Grandma Baldwin's back porch listening to stories, watching birds, learning about bats and wildflowers. May 16, 2010 3:13 PM Jennifer said... When a motor flew of the back of another fishing boat and we all went to help look for it. John was looking over the front of the bow and Charlie put the boat in reverse and John went head over tail off the front of the boat in to the water. May 16, 2010 3:16 PM Anonymous said... The parade when the cast iron tub (with Brian Bains? in it) tipped off the huge chunk of foam and sunk to the bottom of the lake. May 16, 2010 3:17 PM Berrylakers said... I heard that the tub flipped off somewhere near our place, and I've been looking for it ever since...would look great in my garden!!! The next time you're in the mood for a movie, why not check out "RIDE WITH THE DEVIL", based on a novel by Daniel Woodrell..a romantic Western that follows 4 people who are fighting for truth and justice amidst the turmoil of the American Civil War, starring Tobey Maguire and Jewel. In one of the scenes, a letter is read aloud that originated from Berry Lake Wisconsin!!! Although this is an older movie produced in 1999, it should be available through your area Library System (I know it's available through OWLSnet in northeast Wisconsin). A BIG THANK YOU goes out to Berrylakers John & Nancy Lehman who reported this news and gave the recommendation! Over 75 people braved a soaking rain to attend the dedication of the Frank Settlement School and Artesian Well Historic Site. The ceremony was short and to the point. Guests huddled under the newly erected shelter to once again hear the iron school bell ring as Muriel Wilke presented a brief history of the school. The grounds were purchased from Rose and Hermon Wildt in the 1890’s for $125. School ran only during the months of October, November, December, April, May, and June; the winter break was planned because of the cold weather. Some of the teachers mentioned were Flora Walsh Frank, Edna Zieroth Wilke, Clarice Heier Strei, and Shirley Frank Buhrandt. The first teacher at the school was Nellie Watts who earned $25 a month, and the last was Wilma Valenta. Many attendees remembered Mrs. Valenta and talked about their schools days. People pointed out where girls’ outhouse and the boys’ outhouse stood and some remember a wood shed. Others talked about the baseball field, a dangerous merry-go-round, walking along Linzy Brook, a loose brick in the schoolroom where kids looked to the outside, piano music at Christmas, kids who licked the frozen water pipe, biking to school, and catching a ride with the milk truck. The committee that worked on developing the site included: Gary Frank, Chuck Matyska, Pat Nelson, John Olsen, Miles Winkler, and Tracy Winkler; but many workers from the Underhill area volunteered their time clearing away fifty years of brush. Muriel Wilke and her siblings donated the original school bell which their father had always wanted to be kept in the community. Others supported the project with monetary donations. Refreshments for the dedication included grilled hamburgers, coffee, soda and of course, a drink from the newly renovated artesian well. 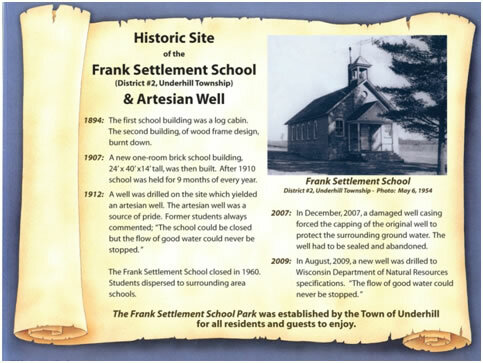 The Frank Settlement School and Artesian Well Historic Site is located west of County Highway R on the corner of School and Kelly Road. Spent our Honeymoon here at Green Gables, and there is no better spot on earth to spend a honeymoon. The most neat and up to date cottage I ever have been in. Was in swimming and just got my feet wet. But will do better next time. Caught some nice fish but had to throw them back in again. Well will spend one and half days here yet but I hate to leave this wonderful place. Hope it is not our last visit to Green Gables. Mr. and myself sure enjoyed especially because Mr. and Mrs. Stanley Korotev and son Jordan were with us. Hope to visit Green Gables soon. Here's to say Goodbye and Good Luck. Mr. and Mrs. George Kadow, married the 16th of June 1925. Personally, I can't imagine sharing space on your honeymoon! Green Gables was located west of your place, Karen, west of the Reverend Damp's place, and two doors east of what was my Aunt Irene's place. She was Irene Gill, older sister of my mother, Jane Korotev. You must have been in Green Gables many times because you and your brothers, and Dave and myself, "hung out" together every summer. And we owned Green Gables for several years until we moved to The Point. Actually, we owned Green Gables and the place up the hill from The Point. Sold them both and bought The Point in the early 60s. My father, Dean, bought Green Gables from his uncle, Frank Korotev, in the 50s. We were there when my brother Dave was in high school and had a driver's license. I remember that because Dave captured a porcupine and brought it back to the cottage in the trunk of Dad's car. Dave left the porcupine overnight in the garage, and, no surprise, the animal escaped by chewing a hole in the garage door. Dad was furious. Not only was the trunk of his car stuck full of porcupine quills, but the garage door was ruined and had to be replaced. I also remember helping to plant all the evergreens that now grow between the house and the road. Dad called it 'the stolen forest' because the then tiny trees came from alongside country roads. Incidentally, the Stanley Korotev referred to in the blog was Frank's brother. Uncle Stanley's son Jordan, also mentioned in the blog, was a long-time resident of Green Bay. His children still live there. "MIDNIGHT A rap at the door - Ellen responds-Man had lost his way inspite and because of Moonshine. Dave & I crawl knee-deep under cover." The County here has suffered from the lack of rain. It is dryer here than any preacher and that's dry. Playing Bridge suddenly we see a cloud of smoke. Lo the Woods is on fire over on the West end of the lake. In a moment the forest is alive with men. "Ye Gods" how a common enemy makes all men Brothers. So a great danger tends to pulverize all social lumps. Berrylakers said...per Angela Rikaby...The DE FIVE are the Korotev's, Frank being my Grandfather. I do know that my family owned a hunting lodge where Curry's is now that used to rent rooms. Is that what this is from? Very cool if it is. Thanks for sharing it. Here’s some info that may jog someone’s memory: My husband, Dennis Cox, remembers hearing about a ‘hotel’ or ‘inn’ that he thinks is now Ken Gruber’s place. Angela: that’s only two cottages away from you –14341 N. Shore Rd. I guess now-a-days it might be called a ‘bed & breakfast’. Back in the 1920's, there was a property on Berry Lake that was called GREEN GABLES. Angela shared the log book that was kept at the property...guests were to write their name, the date, and "other particulars" of their stay there. No one that I've talked to is sure where exactly this property was located, so please comment on this blog if you do. "Green Gables" Log is for the pleasure of its guests. Enter any events, slang phrase or Motto or remarks about record catches (fish or otherwise), parties or special expeditions of any kind that you think will be of interest to yourself or others should you again be a guest at "Green Gables". The photo below is of a log book entry dated July 10, 1923 by DE FIVE (which stands for David, Ellen, Frank, Irene, Virginia, and Edla) and I thought it was worth sharing!